Wellspring Family Resource & Crisis Centre is a Non Profit Organization supporting women, men and children in Whitecourt and our surrounding communities. Fundraising is an integral part of being a Non Profit Organization; it is essential in order to provide the extensive programs and services required to meet the needs of our community. We would like to extend a sincere and heartfelt Thank You to each and every Company, Organization and Individual who donate their time, money, expertise, items, and services to Wellspring. Women, men, youth and children all benefit from the programs provided and none of this would be possible without you. 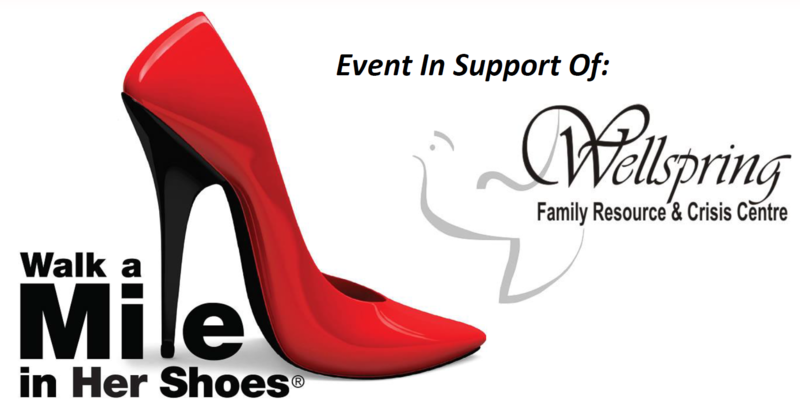 Walk A Mile in Her Shoes Whitecourt is Wellspring’s main fundraising event. It provides an incredible opportunity to bring community awareness to the issues of Family Violence and Violence Against Women in a lighthearted way. Men in our community slip into a pair of red leather 4” heels, participate in a relay and walk together at the Allan and Jean Millar Centre. Opportunities for Community Partnerships and Industry Involvement are plenty as we offer Corporate Sponsorship options with or without participating walkers, Teams, Individual Walkers and Volunteer Positions! Several groups of men from various companies and organizations strut their stuff while community members cheer them on! This event takes place in July, at Wellspring’s Twice is Nice – Midtown Mall. To Register a Walker or Team for the 2018 Walk A Mile Event, please click the Red Shoe! Click the Shoe to Register! Sponsorship comes in many forms. We receive financial support, both large and small shelter items, donations of supplies, acts of kindness, volunteerism and endorsement of programs and services from other agencies. The level of community support we receive is incredible. Wellspring is both a Women’s Shelter and a Community Resource & Crisis Centre. Donations provide basic care items, clothing and household items to those who need them. Personal Care Items and Shelter Necessities are gratefully accepted at Wellspring. Larger items such as clothing, toys and bedding will be accepted at our second hand store, Twice is Nice. These items will be accessible and free of charge for Shelter Clients.